The governor of South Korea's Jeju province vowed Friday to develop the southernmost resort island as Asia's most prominent tourist destination that would accommodate more Chinese tourists. Jeju is already a hot place for vacationers from across the Yellow Sea, and Chinese investors are involved in a number of commercial and construction projects. Provincial government officials regard Chinese money as a crucial source of revenue. The island receives more than two million Chinese visitors annually. 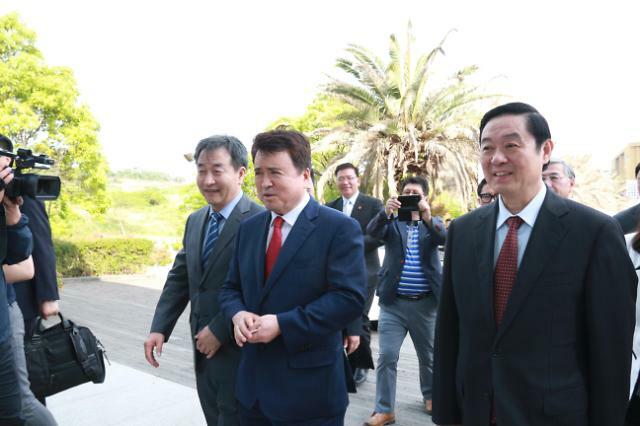 But Jeju Governor Won Hee-ryong was not complacent, saying he would step up efforts to attract more Chinese visitors. "We will develop Jeju as Asia's best hub for tourism and exchanges," he said Friday after attending a ceremony to open a joint exhibition featuring Chinese and South Korean photo artists. "Jeju is the epicenter of bilateral exchanges between South Korea and China." The exhibition titled "Beautiful China, Beautiful Korea" was held to promote cultural exchanges between South Korea and China. 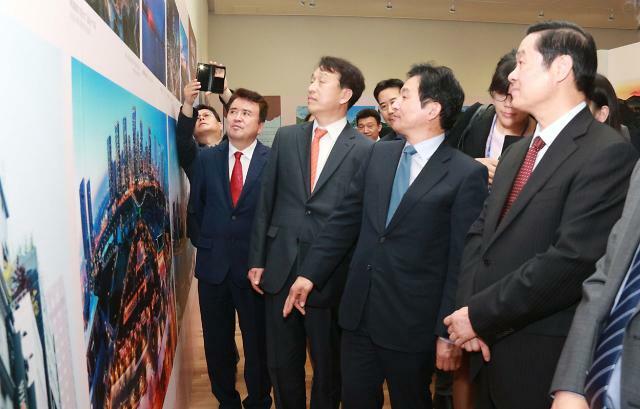 China's publicity chief Liu Qibao led a delegation to the exhibition as part of his four-day visit to South Korea. On Saturday, Liu will drop in Seobok (Xu Fu) Park in Seogwipo, a place frequented by Chinese tourists because of a folk tale that it has miraculous virtues for those seeking promotion. Residents in Jeju say that Xu Fu, a court sorcerer during China's ancient Qin Dynasty, visited the island to look for the elixir of life. The park has become one of the most want-to-visit places sought by Chinese officials since Chinese President Xi Jinping got promoted after praying there. Before flying to Seoul on Saturday, Liu is to inspect the sites for construction with Chinese investments. Government data showed the number of Chinese visitors to Jeju has increased from 115,000 in 2005 to 2.237 million in 2015, bringing wealth and jobs to the island. 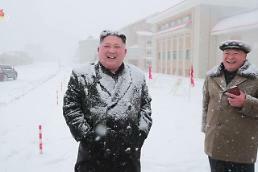 The stunning increase represents improved Sino-Korean relations which were normalized in 1992. Only over a period of two decades, the two countries have seen tremendous growth in trade, cultural, political and other exchanges. Helped by Beijing's eased restrictions on overseas travel, Jeju has emerged as a perfect place for a vacation by Chinese tourists because of its geographical proximity and a special visa-free program that would allow them to stay freely for up to 30 days. Another crucial and probably more important factor is the growing popularity of Korean pop songs, movies and TV dramas in China. Residents in Jeju said a rising flow of Chinese visitors into the island has contributed much to the region's economic growth and brought a broad change to their daily life and economic activities. "I think Chinese tourists have become an important part of our life and economy," a 29-year old Jeju native working at Jeju International Airport told Aju News on condition of anonymity. A report by the Honam Regional Statistics Office which piled Jeju-related data showed that the rate of Jeju's gross regional domestic product, measuring individual output in accommodation and food service sectors, soared by 57 percent from 15.23 million won (12,962 US dollars) in 2005 to 23.91 million won in 2014. The increasing rate was higher than a national average of 54 percent, indicating Jeju has benefited much from Chinese money. "The money spent by the Chinese tourists here is a big boost to our regional economy especially in tourism-related businesses," the Jeju native said. "Chinese tourists are very keen on buying local-made products, triggering a butterfly effect that leads to bigger sales of overall South Korean products abroad." Jeju has also seen a surge in Chinese investment in condominiums, hotels and other properties, and the wave of Chinese visitors and investment in Jeju reflects growing economic links between the two countries. 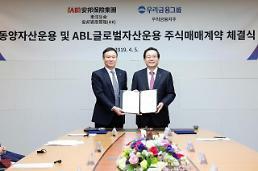 China is now South Korea’s biggest trading partner. Data compiled by the state-run Korea Tourism Organization showed Chinese travelers accounted for 45.2 percent of 13.23 million foreigners who visited South Korea last year, followed by the Japanese with 13.9 percent. South Korea received 5.98 million Chinese visitors, down 2.3 percent from a year ago, in 2015 when its tourism industry was hit hard by the Middle East Respiratory Syndrome (MERS) outbreak which killed 38 people, leading to a 6.8 percent decline in the number of total foreign visitors. It was the first decline since 2003. Tourism officials, however, say the decline is temporary, and a poll released by the Korea Culture and Tourism Institute in January found that most industry players were upbeat on this year's business outlook. South Korea is still seen by Chinese tourists as a favored destination, despite complaints among them about a language barrier, high prices, and the lack of tourism-related infrastructures such as food and accommodations, and the bureaucratic red tape.